DB Breweries has been shocked to learn that billboards such as this one weren’t taken seriously. Beer brewing giant DB Breweries has been horrified to learn that, for many years, people have been taking their iconic Tui billboards sarcastically. The billboards, established to advertise DB’s famous brand of Tui beer, feature short statements on a black background next to a red panel that reads “Yeah right.” The statements on the billboards have long been understood to be sarcastic, but the company now insists that was all a horrible misunderstanding. 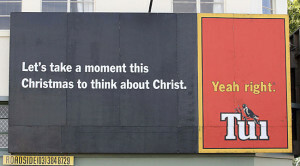 The clarification has wildly altered the interpretation of many of Tui’s billboards, including their well-known Christmas billboard Let’s take a moment this Christmas to think about Christ. That advertisement was often thought to be a commentary on the commercialization of Christmas and the growing irrelevance of religion in New Zealand. The revelation sheds new light on many other Tui classics, including U2 can change the world, once interpreted as an expression of cynicism about lead singer Bono’s humanitarian efforts, and When Winston says no, he means no, a reference to the New Zealand First Leader’s denial that he accepted anonymous donations from millionaire Owen Glenn. The clarification has also helped to clear up confusion amongst some about two of Tui’s recent billboards, Beer is good and Adolf Hitler should never have exterminated the Jews. In related news, ASB Bank has recently revealed that its famous Goldstein ad campaign was meant to drive customers away from the bank. “We were trying to show that only a half-witted foreigner would bank with ASB” said the company’s chief executive.